The mission of Piner-Olivet’s Music Education Program is to provide all students with an equal opportunity to learn the art of music. 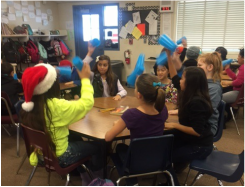 Students learn to create, perform, listen to, read, understand, and respond to music in a meaningful way. Through the use of pitched percussion instruments (marimbas, glockenspiels, metallophones, and boomwhackers), unpitched percussion instruments (egg shakers, maracas, etc. ), dance and vocal instruction, K-2 students are provided with a well-rounded early childhood music education. 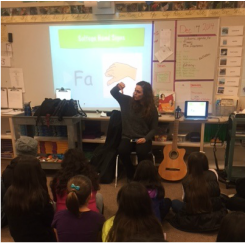 ​3-6 grade students are taught the foundations of music from four of the major instrument families: strings (ukuleles), woodwinds (recorders), percussion (drums), and voice. Students are prepared to play in beginning ensembles as they enter middle school. Hello! My name is Ms. Rachel Lawrence. I graduated from Sonoma State University and the University of Southern California. I have a Masters Degree in Teaching, a Multiple Subject Credential and a Single Subject Music Credential. I grew up in a musical family and have been playing music my entire life. I am thrilled to teach music with the POUSD team!